The Thin Mind program will combine hypnosis, mindfulness techniques, and a sensible and balanced eating plan to help you on a your journey to a healthier self. The Thin Mind program will be organized by Erik Muten, MFA PsyD, and Michele LaRock, MS RDN LDN. Erik is a behavioral health psychologist who wrote his doctorate dissertation on hypnosis, and Michele has been a registered dietitian/nutritionist for over 15 years. 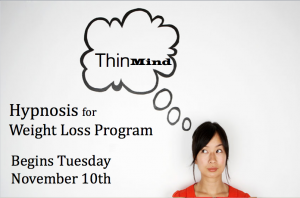 The Thin Mind: Hypnosis for Weight Loss program begins with an introductory session on Tuesday November 10th from 7pm-9pm. Following the intro session, there will be a hypnosis session held on Saturday November 14th from 9am-11am. Both sessions will be held at Atkinson Family Practice, 17 Research Drive in Amherst MA. To register, please call 413-570-3281. 1. Is hypnosis helpful for weight loss? It can be. Studies show that hypnosis is helpful for weight loss when it is supported. That support can be in the form of talk therapy or nutrition therapy. Our program incorporates nutrition support from a licensed dietitian. 2. How is your program different from other programs? Both Michele and Erik are licensed health professionals who are experts in their respective fields. The Commonwealth of Massachusetts requires high standards for obtaining a professional license as well as continuing education to maintain that license. We take nutrition and hypnosis seriously and have a strong passion for the science behind both fields. Not everyone will be successful using hypnosis for weight loss. We use a thorough screening process to evaluate people before they participate in the program. We want you to be successful, and are honest with you if we conclude that hypnosis might not be the best approach. This screening process ensures that you will get your money’s worth out of the program. Some hypnosis programs incorporate “fad” diets that are highly restrictive and unsustainable over time. Participants in these programs may experience initial rapid weight loss but, at some point, find that the “trance” has been broken, and the weight comes back on rapidly. Our program incorporates a balanced, whole-foods based eating plan that can be maintained and enjoyed over time. 4. What do I get for my money? Audio recording of the session for you to have as a refresher. Nutritional guidance: You will be encouraged to follow a nutritionally sound eating plan that will be reviewed at the intro session. 3. Do you charge for refreshers? No. In fact, the entire hypnosis session you attend will be recorded and made available to you to listen as often as you’d like (at no charge.) The recordings are a great supplement to this program.